Much of Maharashtra and central India is characterised by hills and badlands that bear the distinctive, tell-tale signs of ancient volcanism. This vast expanse, known as the Deccan Traps, is at the centre of the nastiest feud in science: the debate about what killed the dinosaurs. The mainstream consensus is Nobel laureate Luis Alvarez's famous 'bad weekend' scenario: "big rock from the sky hits the dinosaurs, and boom they go". The discovery of the 66-million-year-old Chicxulub crater has bolstered this theory's credibility. One geologist, however, disagrees, and she has endured decades of ridicule for it. Gerta Keller argues that the Cretaceous-Paleogene extinction event (dinosaur extinction) was caused by a series of colossal volcanic eruptions — the aforementioned Deccan Traps — and their environmental consequences. Keller has paid a steep prize for her resistance to the Alvarez hypothesis. She has ploughed a lonely furrow, bravely enduring insults, threats, slander, discrimination and attempts to destroy her career. Her decades-long perseverance, however, has paid off, and it is now widely accepted that the dinosaur extinction may have been caused by a combination of the Deccan volcanism and the Chicxulub impact event. The acrimony over what killed the dinosaurs is eerily similar to the nastiest feud in the study of ancient history: that over the identity and origin of the people of India's ancient Indus Valley Civilisation (IVC) — a more appropriate name for which is the Sindhu-Sarasvati civilisation. Ever since the German orientalist Max Müller proposed the Aryan Invasion Theory (AIT) and arbitrarily assigned a date of 1500 BCE to the Rig Veda, the consensus among 'mainstream' historians has been that India's indigenous people were dark-skinned 'Dravidians' who built the IVC, and that Sanskrit-speaking, Vedic-Hinduism-practising, light-skinned 'Aryan' invaders from the Central Asian steppe destroyed their civilisation, subjugated them, and imposed Hinduism and the caste system throughout India. The AIT is essentially the 'bad weekend' scenario of history: "big bad horse-riding Aryans invade the Dravidians, and down they go". This 19th century narrative is still taught as fact in India's textbooks, albeit with a twist: because archaeologists failed to discover a single sign or evidence of an invasion after over a century of searching, it is now claimed that the Aryans 'migrated' into India. On the other hand, soon after India's independence, evidence began to emerge that invalidated the theory of an Aryan invasion or migration from outside the geographical realm of India's civilisation. In fact, the evidence pointed to population expansions westward, from within India. The evidence kept accumulating, and its pace picked up as the decades went by. Linguistic evidence. Archaeological evidence. Literary evidence. Evidence of cultural continuity that spans seven millennia, possibly more. Hydrological evidence of a long-dead, mighty river. Hydronyms, toponyms, demonyms, evidence from ancient myths that bridge the vast expanse between India and Ireland. Too much evidence, in fact, to present here. I have written an overview here, you may want to look at it. Scholars such as BB Lal, David Frawley, Koenraad Elst, Shrikant Talageri, Michel Danino, SR Rao, Subhash Kak and Nicholas Kazanas, among others (apologies if I have missed anyone of note), contributed in various ways to the discovery of this evidence. Then in the 21st century, genetic evidence began to emerge that started dismantling what remained of the AIT. All of this evidence points in the same direction: that rather than India being invaded by 'Aryans' around 1500 BCE, it was ancient Indians who expanded rapidly westward around 2500 BCE — a massive, rapid, male-mediated demic expansion (imagine warriors on horses) — and brought Indo-European languages, culture and genes throughout Europe and as far west as the British Isles. Yet, this veritable avalanche of evidence has been studiously ignored for decades by Western academics as well as India's state-sponsored Marxist academic establishment. Like Keller, many of the above-mentioned scholars were marginalised by India's entrenched Marxist establishment, their works relegated to scholarly journals, banished from India's textbooks. Some were ridiculed; some were abused or harassed. Attempts were made to bribe others with various inducements. The attacks still continue, in various forms. Only recently, when social media revolutionised public discourse in India and gave citizens a voice for the first time in a millennium, did their work become widely available to the Indian public. The avalanche of evidence that falsifies the AIT has understandably perturbed and nonplussed the Marxist establishment and their allied left-'liberal'-secular ecosystem, whose writ went unchallenged for decades. 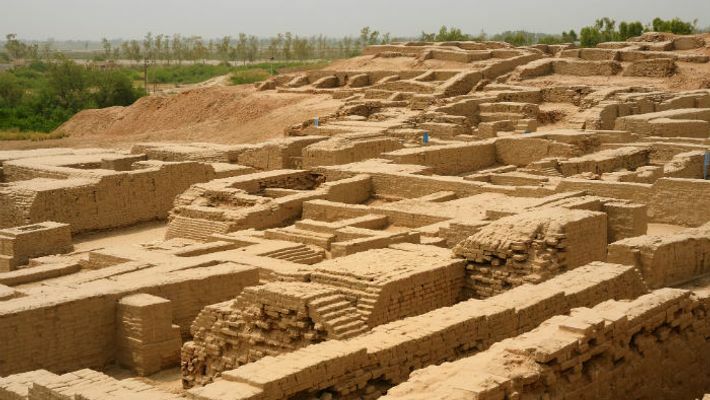 In 2015, it was announced that a team of archaeologists led by Vasant Shinde had discovered four well-preserved, nearly 4500-year-old human skeletons in Haryana's Rakhigarhi village, which is the location of the IVC's largest known site. They became the first team ever to successfully extract DNA from IVC bones. What followed was a long wait for the results to be published, a wait that apparently will soon come to fruition. The Rakhigarhi discovery sent the Ecosystem into a panic. It responded by unleashing the full power of the media machinery at its disposal. A motley assortment of 'eminent' journalists suddenly metamorphosed into experts and began weighing in on the topic (for the unaware: India's mainstream media has long been subservient to the Ecosystem): people like Shoaib Daniyal, Tony Joseph, Hartosh Bal, Girish Shahane, Aroon Purie, Kai Friese and others whom one would normally not associate with anything scientific or historical. Reams of questionable news began being published in a frenzied, choreographed attempt to misinform the public and bury facts and scientific evidence under a deluge of propaganda. The modus operandi is simple: seize upon every small, incremental news item, story, or rumour about Rakhigarhi or anything associated with it, and misinterpret it in such a way that it appears to support the AIT. I have in the past debunked attempts by such propagandists to 'settle' the AIT debate, and to misinform the public about the results of an archaeogenetic study of 612 ancient individuals. A new article appeared on August 31: a rambling, incoherent piece littered with thinly-disguised anti-Hindu(tva) invective, in which author Kai Friese attempts to pre-empt the publication of the Rakhigarhi DNA results, and claims that the evidence will "unsettle Hindutva nationalists". In the article, Friese cites a range of experts and influential people such as Max Müller, Dayananda Saraswati, Bal Gangadhar Tilak, MS Golwalkar, Swami Vivekananda, Sri Aurobindo, Sanjeev Sanyal, David Reich, David Frawley and Romila Thapar, in an attempt to appear balanced and neutral. The article suffers from numerous glaring deficiencies, which I shall now deconstruct. Fact: Shinde et al's research is yet to be published. Also fact: Unpublished research is confidential. It is kept secret before publication. No scientist worth his/her salt (let alone a seasoned, senior researcher such as Shinde) will reveal the results of an important scientific study to anyone (let alone a journalist) in any form, even verbally, before its results are officially published in a scientific journal. It is therefore hard to believe Friese's claims that Shinde and Niraj Rai have generously made him privy to the results of the study. Friese's claims that he drew his conclusions based on 'conversations' with Shinde and Rai are simply hearsay. His claim of having spoken with them on the phone may perhaps be believed, but it is hard to believe even for a moment that they revealed anything of value to him. Even if we take Friese's claims about the study's findings at face value, there's the inconvenient fact that the study refers to a single DNA sample (according to his own claim). The IVC is believed to have had a population of over five million inhabitants at its peak. Clearly, one needs to study at least several hundred ancient DNA samples collected from across the civilisation's enormous geography in order to form a reasonably good idea of its inhabitants' genetic profiles and variations. A single partial DNA sample is woefully inadequate. This invalidates Friese's sweeping conclusions about the IVC people. It is known that burial and cremation were not mutually exclusive in the IVC society. There is evidence of burial of selected bones after cremation (in which no DNA is preserved), and also of symbolic burials in which the bones are completely absent. Moreover, there is strong evidence that cemetery burial was limited almost exclusively to first generation immigrants in IVC society. There is therefore the strong possibility that DNA retrieved from IVC burials may not represent the IVC population at all. Friese is either ignorant about this, or intentionally neglects to inform the readers of this important fact. One need not be a scientist to understand that a person's DNA does not reveal the language(s) they spoke or the religion(s) they practised. If a French person learns to speak Hindi, does it alter her DNA? It does not. If a missionary converts an Indian person to Christianity, does it convert the person's DNA too? It does not. Nevertheless, Friese attempts to sell his readers the falsehood that DNA reveals language as well as religion. The R1a1a haplogroup is found in approximately 17% of Indian males (to understand what a haplogroup is, look here). It is found in high frequencies in northern Indians as well as southern Indians, in north-eastern Indians, in tribal communities, and in 'low castes' as well as in 'high castes'. It is found in higher frequencies than the national average (~27%) in the Saharia tribe of Madhya Pradesh and the Chenchu tribe of Andhra Pradesh and Telangana. All communities of Indians carry this distinctive mutation, even those perceived to be 'Dravidians', 'dalits', and 'scheduled tribes". Since Friese claims that 'Dravidians', 'dalits', and 'scheduled tribes' are indigenous pre-Aryan peoples, according to his own logic and terminology, R1a1a should be called the 'pre-Aryan gene'. This study published in the journal Nature clearly establishes that R1a1* originated in India, and is at least 18,000 years old (possibly up to 44,651 years old). This more recent study also concludes that R1a1* originated in India, and is at least 15,450 years old. These studies establish India as the source of the R1a1* family that conquered the world. These findings falsify Friese's claims that R1a1* originated in the Central Asian steppe. Yes, R1a1* did exist in the Central Asian steppe, but it reached there from India. Friese is either ignorant of this fact (he claims that the average Indian owes 17.5% of their male lineage from the steppe, which is utter nonsense), or deliberately chooses to not inform the readers about it. Friese accuses Rai of "prevaricating". He claims that Shinde is "given to dropping broad hints". He accuses Shinde of "dissembling", of threatening and arm-twisting the American geneticist David Reich over access to IVC samples, and of forcing him to change terminology in a paper they co-authored (with other scientists). Citing anonymous sources, he accuses the Indian team of having "discomfort with politically inconvenient results". Shooting off Reich's shoulders, he accuses the Indian scientists Lalji Singh and K Thangaraj of forcing Reich to resort to "terminological sleight-of-hand". These are serious accusations. Friese is essentially siding with Reich and indulging in character assassination of an entire team of Indian scientists, without any credible evidence. The article is a hit job. It does not take a genius to understand at whose behest he has written it. Reich is a well-known proponent of the AIT. He is infamous for making political remarks about Hindutva and implicitly comparing it with Nazi ideology. Let's be clear: a scientist should never dabble in politics, because it compromises his/her objectivity as well as credibility. Nearly all Western researchers, be they geneticists or historians, support the AIT, either implicitly or explicitly; so do most Indian researchers who work abroad (some may well do so under duress). It is India-based researchers who have begun to express themselves freely, of late. Indian scientists have begun asserting that the Aryan invasion never happened, and are backing up their assertions with research and data. The hydronym Sarasvati — long taboo in academia — has started appearing in scientific literature, such as this paper published in the world's pre-eminent scientific journal. The Marxist stranglehold is slowly being dismantled, and genuine, fact-based research is gradually beginning to flourish. Friese's extensive quoting of Reich and championing his research and opinions reveals a hidden nexus between India's Marxist academia (and left-'liberal'-secular ecosystem), Western pro-AIT academics, and India's mainstream media. To summarise, Friese's article is a litany of lies, insinuations and character assassination. It is a poor attempt at propaganda. It has no basis in the truth. The truth will be known when Shinde et al's paper will be published, hopefully soon. Even that paper will represent only the first step in learning the truth about the genetics of the IVC people. The truth will be out, sooner or later. It has a way of revealing and asserting itself, no matter how strong the opposition. Just ask Gerta Keller.